This year Venerable Khenpo Tsewang Dongyal Rinpoche is requesting the International PBC Sangha to accumulate the mantra of the Buddha Amitayus, the buddha of infinite life and prosperity. Amitayus (Skt. Amitāyus, Tib. ཚེ་དཔག་མེད་, Tsepakmé; Wyl. tshe dpag med) is a sambhogakaya aspect of Amitabha, particularly associated with longevity. The following prayer is a famous terma known as Union of All Jewels revealed by the great terton Jatson Nyingpo, and is found in the PBC Daily Prayers sadhana prayer book on pages 58-59. 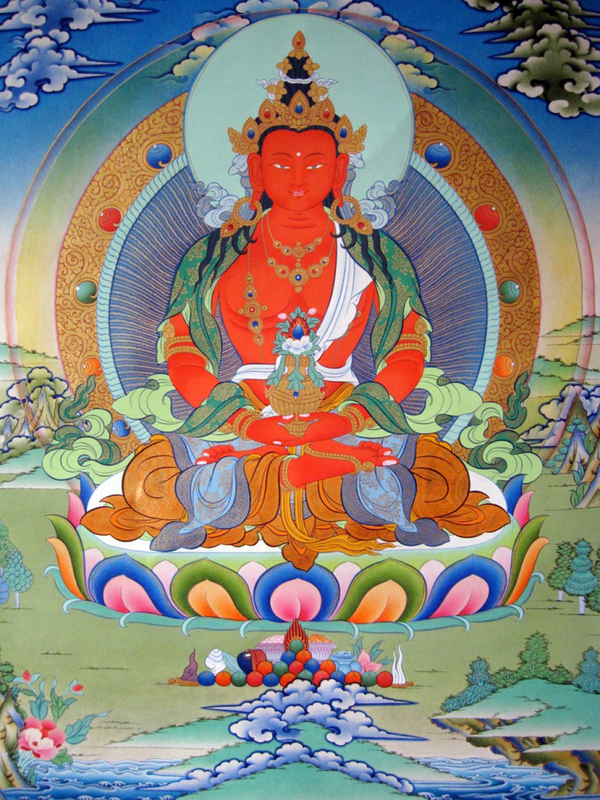 The Noble Beginning of Refuge and Bodhichitta, together with lineage prayers and turning your mind towards the Dharma. The Noble Middle of practicing the Visualization Creation Stage and the Dissolution Completion Stage, while abiding in non-grasping wisdom emptiness-awareness (absolute bodhichitta). The Noble Conclusion of Dedication and Aspiration Prayers. Begin by reciting the Seven Line Prayer three times, followed by lineage prayers. Then visualize Amitayus in the sky in front of you either as a single buddha or yabyum, and begin the sadhana by reciting the homage to Amitayus on page 58 twice in Tibetan and once in English. After you accumulate the mantra during your meditation session, Buddha Amitayus dissolves into you. Remain in silent meditation for as long as you have time, abiding in the true nature. 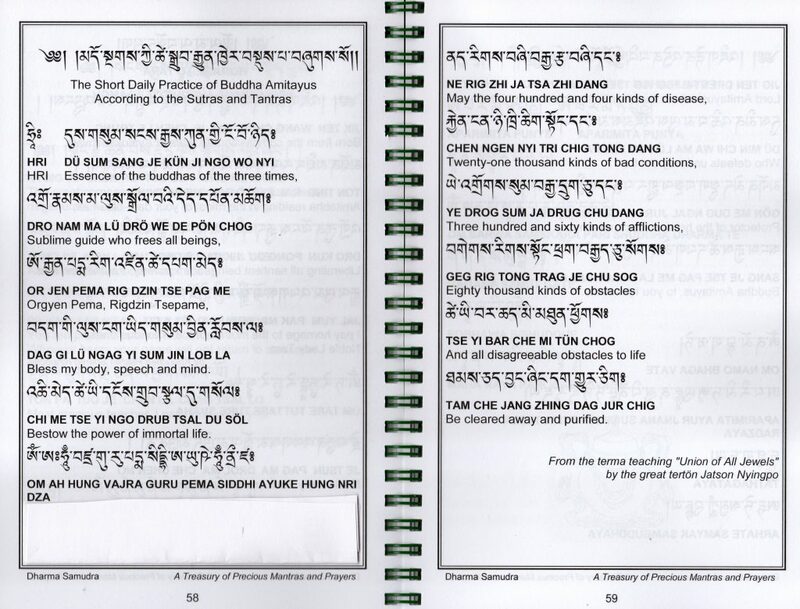 Conclude by reciting the brief dedication prayer on page 59 in Tibetan and English, as well as reciting more extensive prayers on pages 28-42, dedicating the merit and making sincere aspiration prayers for the immediate happiness and enlightenment of all beings.